But the Sony LF-S50G Wireless Speaker looks less like Google Home and more like Apple’s HomePod. Sony's smart speaker includes Google Assistant and a touch-free control panel. Panasonic, Anker, and Mobovi aren’t the only companies at IFA showing smart speakers with Google Assistant built in. Sony announced this morning that it will ship a $200 smart speaker in mid October. The Sony SF-S50G Wireless Speaker, which looks surprisingly like Apple’s upcoming HomePod smart speaker, features a single full-range driver that fires up into a two-stage diffuser to produce 360-degree sound. That driver is augmented by a dedicated subwoofer firing down into the same diffuser to reproduce bass frequencies. Sony hasn’t released detailed specs for the new speaker, so we don’t know how big its amplifier is, but a spokesperson said it can comfortably fill an average-sized room with sound (defining “average” as a 25x16-foot living room or kitchen). 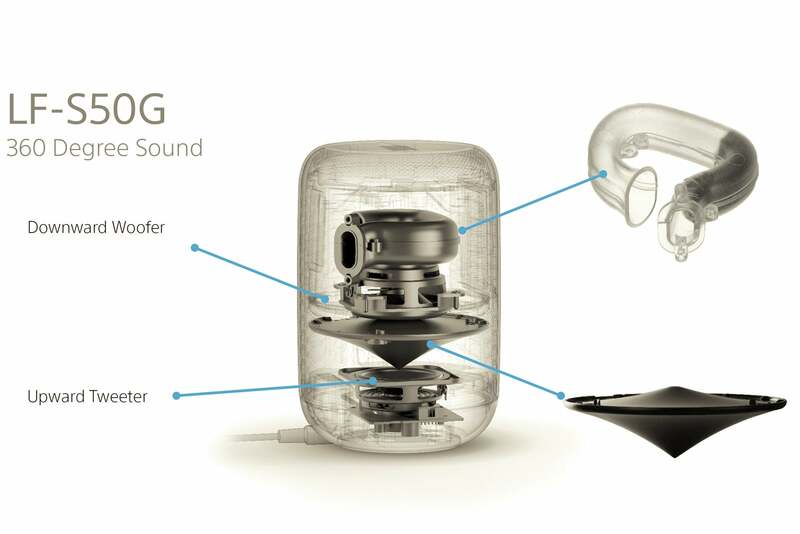 This illustration shows how the Sony LF-S50G smart speaker’s driver and subwoofer are configured. Bluetooth and NFC support, in addition to the Wi-Fi connectivity Google Assistant requires, allows the SF-S50G to function as a Bluetooth speakerphone when paired with your smartphone. The speaker will also respond to gestures for starting music playback, controlling the volume, and skipping tracks.